Achieve a smoother shave with men-ü Shave Creme; a multi-award winning, ultra-concentrated formula that allows superior razor glide to minimises nicks and burns. Enriched with soothing and naturally antiseptic Tea Tree Oil, the shaving cream lasts up to 165 shaves and creates a protective barrier over the skin's surface for a closer shave with less resistance and reduced irritation. Packed with lubricants and moisturisers, it helps provide optimum slip without drying the skin. Skin feels fresh and comfortable. Can be used with or without a shaving brush for high-performance results. Use warm water to moisten the area and apply 1-2 pumps of shaving cream onto a wet hand or brush. Spread in a circular motion to generate a rich, creamy lather. Rinse well after shaving. Definitely a winner! Ultra concetrate a little goes long! Some people will think the 100ml bottle will not last long but trust me, it will. I'm shaving day after day and it lasts for me about 10 months (using always 1 pump at a shaving brush). Merry Christmas and a happy new year! In my opinion this is the best shaving creme on the market. which does exactly what it claims !! Have used Men-u Shaving creme for years, giving best comfortable clean shave --so why change now !! The product really gives a smoother shave as promised. I recommend. Positively the best shave cream ever. It's not cheap but it lasts for ages giving a moist and lubricating lather for the perfect wet shave. Excellent cream, lathers very well on the shaving brush and gives very good shave. In the end is cheaper than the ordinary jel as lasts much longer. This was awesome when I first used it back in 2007 and my wife got me one as a stocking filler for Christmas as it still looks pretty fully. It goes against the grain as it's such a small bottom but small is great. Smells nice, razor glides and does it nick my skin. A great product at a really cheap price! I obtained a small tube of Men u shave creme as a free sample. On using it I was amazed by the very smooth shave I had using it. Though the 100ml is a bit more expensive than my normal shave gel. I find it better value. My shaves are great and the creme seems to last for ever! Superb product. Small bottle don't be out off. Goes a long long way. Personally if you are to buy the product then don't fail to add the men u shaving brush , they compliment one another immensely . Leave skin feeling healthier and smoother than most other crèmes. When used with other Men-U products it helps soothe the skin. Forms a great, creamy lather from small amount! Always come back to this product. A little goes a long way and great for a smooth shave. lathers up just enough without all the air bubbles of a foam or gel. Well worth the money! 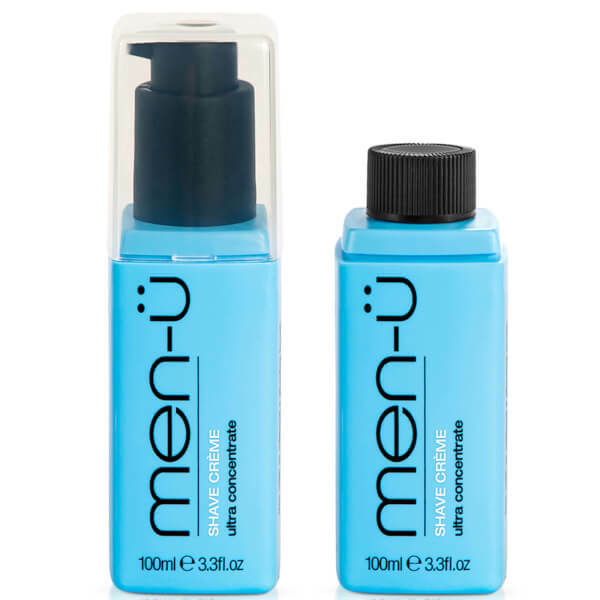 Very pleased with Men-U Shave Creme, it gives ample lather and the feeling on your skin makes you feel alive. Very pleased with the container and the open and closed system on the applicator is good. I am pleased with my purchase and will be buying again when needed,I recommend this shaving cream to everyone who wants a shave that's different.